Matt Wimmer with a lamb. Click for more Sheep and Pickle Farm photos. There are some new fuzzy homesteaders these days at the Catamount Outdoor Family Center in Williston. That’s because Katie Sullivan, proprietor of Sheep and Pickle Farm, has taken up residence on the property and raises sheep, which she uses for both meat and yarn. The sheep have gotten so accustomed to having people run or bicycle past them since moving to the spot last year, they have been known to baaaahhh their hellos to the traveling bipeds. Sullivan’s first agricultural step was a 2011 internship on a goat farm in Brookfield. She decided to get her own livestock the following year. 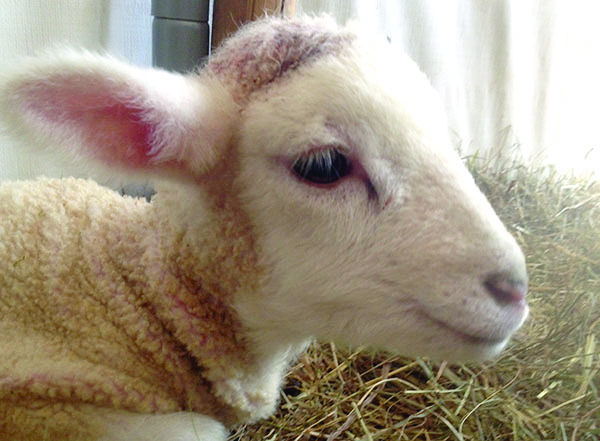 “I jumped the gun on getting sheep,” she said, noting that she didn’t own a home at the time. Sullivan’s sheep grazed with neighbors, and she visited with them each day. She also grew a lot of her own food at that time, and bartered meat for other products. The result: the decision to go into business for herself. Last year, Sullivan moved her growing brood to Williston, where they help maintain the pasture at Catamount Outdoor Family Center. The sheep rotate from field to field, happily trimming and fertilizing the grass. Sullivan’s formal training is in dairy goat management and genetics. She said she’s happy to have switched her allegiance to sheep though. Sullivan describes herself as a “nerd at heart” so she has the ability to throw herself full-tilt into any endeavor — including keeping track of numbers and stats for her brood. With goats, that means Sullivan has kept tabs on ways to improve milking and prolong the lives of the animals, but she is able to translate those skills to her sheep as well. Meat, in the form of lamb and mutton, accounts for two-thirds of the revenue of the Sheep and Pickle Farm, which is one of a few homesteads on the Catamount Family Center land, which is privately owned by the McCullough family. Katie Sullivan feeds her sheep at Williston’s Sheep and Pickle Farm, which raises sheep for wool and meat. The rest of the proceeds come from fleece, with the shearing sold to different spinners, depending on the cleanliness of the product. Most of the yarn is spun at Hampton Fiber Mill in Richmond. Sullivan sells her fleeces and yarn on Etsy, but prefers if local potential buyers can stop by the farm for a sample. Sullivan’s mother used to be a knitting teacher, and she helps with the business by providing patterns for aspiring knitters who come by, although they are also available online. Although Sullivan no longer grows many vegetables or barters for food, she kept the Sheep and Pickle name, which she thinks is a more memorable one than many traditional farm names. Sullivan makes it clear that although her sheep are friendly and willing to be petted even by strangers – even hugged — they are not pets by any stretch. Sullivan realizes that it is somewhat clichéd, but she believes the sheep are very much like people. She says kind, humane treatment can be something that goes hand-in-hand with agricultural use, and she admits they do make good companions. “Nothing lowers your blood pressure faster than sitting on a bale of hay and letting a ram nibble at you or watching sheep do what they do, slowly and deliberately,” she said.